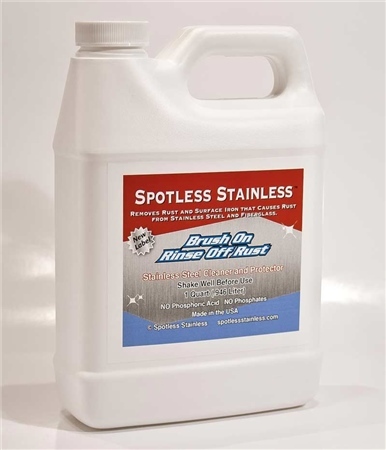 Spotless Stainless Rust Remover (Cleaner) and Protector is a revolutionary new product that removes rust and the "surface iron" that produces rust from Stainless Steel. It leaves a rich chromium surface on Stainless Steel and when exposed to oxygen in the air forms a tough protective oxide layer. This Chromium oxide layer protects Stainless Steel and will extend the time between cleaning. It does not use caustic chemicals that are dangerous and toxic to the environment. Many rust removal products use concentrations of strong acids that may remove the rust from Stainless Steel, but in most cases leaves the surface iron to rust again. By not removing the surface iron rust will return quickly and you may have more rust than before. Highly concentrated, strong acids may damage Stainless Steel by exposing more iron or attacking other elements in the metal. It worked for me - removed rust streaks from stainless steel. The instructions states that it likes to operate at >21 degC, but it seemed to work happily for me at a lower temp.